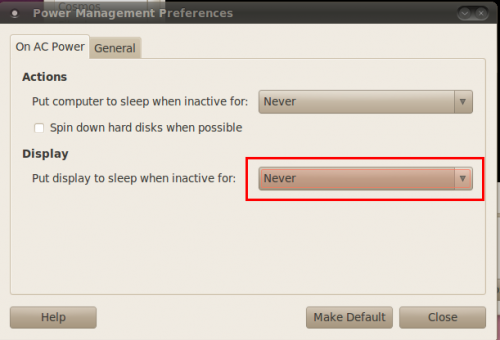 If you want to watch a moive in Ubuntu,you might want to disable the screensaver and make the display never asleep.And this quick tutorial will show you how to do this. First go to System->Preferences->Screensaver.You will see the following screen,un-check “Active screensaver when computer is adle” and “Lock screen when sceensaver is active”. Then,click on Power Management button at bottom.Under Display,set “Put display to sleep when inactive for” to Never. Now,the screen will never turn black when you’re watching movies! 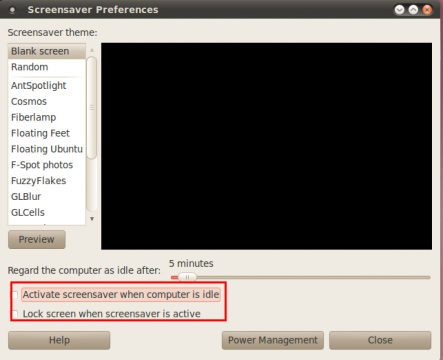 5 users responded in " Disable screensaver and make Display never sleep in Ubuntu 10.04 "
It would be nice if we had a little background information. Not just a recipe, click here, click there. Anyway thank you for the effort, I’m sure it works for some. try “xset” to configure many screensaver/display properties via scripts. I got fed up with the screen keep going to sleep when flying X-Plane 9. Went to System > Preferences > Screensaver, and slid the timer bar across to max 2 hours. Now I have at least 2 hours before the screen goes to sleep from the last time the mouse got moved. I had tried to put never into the power save mode, but this NEVER worked for me. I applied above, screen goes black every 5 minutes, very irritating. iss this a bug or a feature?? I hope somebody has a working suggestion, please? Execute this file before watch your movie and the screen save is disabled.